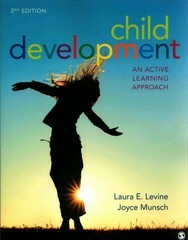 Child Development 2 Edition With its hallmark active learning approach, the second edition of this topically-organized text is the most interactive introduction to child development today. Dynamic learning activities in each chapter invite students to forge a personal connection to the latest topics shaping the field, including neuroscience, diversity, culture, play, and media. Using innovative pedagogy, Child Development: An Active Learning Approach reveals a wide-range of real-world applications for research and theory, creating an engaging learning experience that equips students with tools they can use long after the class ends.